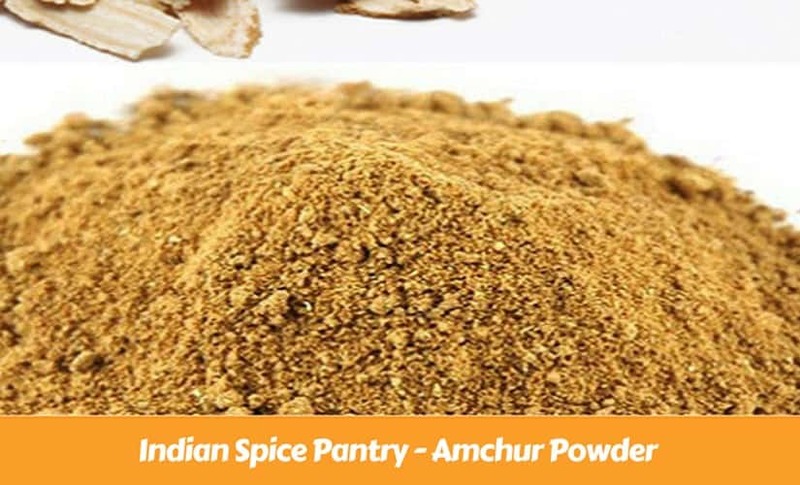 Amchur powder or Dried Mango Powder is a plain beige coloured fruity souring Indian spice. Made from dried unripe green mangoes ground into powder and used as a spice to add tartness to dishes. Unripe mangos are first cut into pieces and left to dry for few days before grinding it to powder which is then commercially packed and sold. You can also find dried green mango slices being sold in specialist or health food stores. It is usually used to made curries especially in vegetarian dishes and used extensively for making Indian savoury street food known as Chaat! It adds a sour taste to dishes so caution must be taken when using it. Adding too much may make the dish too tart and unpleasant. Although not a must-have spice, it sure does lift flavours of the dish and give that tangy bite. Let’s understand more about this tarty spice. Amchur powder is a sour spice with a slight sweet undertone. It has a very strong taste so must be sparingly used in dishes. The taste of this spice is very uncomplicated that is, it is sour. So you know the effect on taste adding the spice to food will be. It falls into the sour spice category. It means that amchur should be used in small quantity to make spice mixes and blends. Amchur is made of green mangoes, it is used in dishes which requires a tangy taste. It is an add-on ingredient for making many different Indian street foods such as chaat dishes like alu tiki, samosas, chutneys etc, curries like chickpea curry, lentils etc, stir fried or deep fried dishes such as pakoras or patties. It is also a popular spice for making spice rubs and spice blends for marinades, spice mixes and sauces. Try using a pinch of this spice in your roasted vegetables, stir-frys or even for salad dressings and mocktails to give your dish a tangy twist. Amchur powder is not the only souring spice used in Indian cuisine. There are many different ingredients that you can use to add a tangy base to your dish. Yoghurt, lemon /lime juice, tomatoes, vinegar, pomegranate seeds/powder, sumac, kokam fruit and taramind fruit pulp to name a few. The difference here is on the level of sourness, their distinctive taste and their use during the cooking process. While yoghurt and tomatoes are used mainly at the beginning of the cooking process, pomegranate powder, vinegar and kokam fruit are usually used in the middle of the cooking process when your dish is not yet complete. Amchoor powder, sumac, lemon juice, taramind fruit pulp are normally used at the end of the cooking process or even as a seasoning for an uplifting sourness. Although the use of all is to add tartness to a dish, the type of ingredient you use depends on the kind of flavour you wish to add to your dish. Aids in Digestion -The powerful antioxidants contained in mango makes Amchur powder combat constipation, flatulence and acidity. Consuming a teaspoon of Amchur powder will help in maintaining a healthy digestive system. Improves Skin Health – Amchur powder contains vitamin A and vitamin E that is required for healthy skin and eyes and improve skin texture. Aids detoxify body– Dry mango powder has vitamins A, C, D , B6 and Iron in abundance. All are beneficial to remove toxins from the body, treating anaemia and curing the nervous system disorders. In ancient Ayurveda, amchur has been used to treat diarrhoea, urinary tract infections and dysentery. Treats And Prevents Scurvy – Scurvy is a medical condition that is caused due to lack of vitamin C. There is an abundance of this vitamin in Amchur powder that can prove helpful in the healing of scurvy. Consuming one part of mango powder with two parts of jaggery helps to treat scurvy. Since Amchur powder is not a very common spice, it may not be readily available in the normal supermarket unless it has a dedicated Indian section. You can buy this spice from any Indian grocery store or health food store. Wherever you choose to buy it from make sure it is from a trusted source. Amchur powder should be light beige to darker shades of beige in colour with a powdery texture. Ensure that the powder is smooth and not lumpy. Check the manufactured date as old Amchur powder tends to have less taste. Like most spices, amchur powder tends to lose its freshness if not stored properly. Amchur powder should not be used extensively. Use it only if you need to add a tang to your recipe or even drink. As the taste of Amchur is sour, amchur powder can be substituted by many other ingredients with a similar taste. Select the best amchur spice substitute keeping in mind the recipe. If it is only to add a hint of sourness then the powdered or liquid form of substitutes such as vinegar or lemon juice may work. Wet ingredients such as yogurt, kokam fruit or tamarind pulp will have an effect on the consistency of the dish while adding more acidity. Have you heard or used Amchur powder for cooking? I love to hear your kitchen adventures so please share any recipes or tips. Love this informative post! What an interesting read!! Such an informative post! I always have some amchur powder hand in my pantry! Wow so much information! I had never heard of this nor have I used anything like it. Very interesting read! Thank you for sharing! So glad that you got to read about a new kind of spice. I love learning about new spices – and I love that the Internet makes it easy to get them! Is’nt it amazing to see how many different food items are there that we get a chance to explore nowadays. Hope you get to try amchur someday. Absolutely appreciate this detailed post Sunrita! This post is a piece of labor! Amazing. I love amchur particularly in Indian condiments and use it a lot in my North Indian cooking. Thanks Sonal for your kind words. Glad to virtually meet another amchur lover! Would be lost without it in my chaat! I don’t remember ever hearing of Amchur powder before, but I’m sure I must have had it in curry. I was especially interested in the health benefits and digestive aid it provides. Hi Scott! Yes Amchur really has many health benefits like most spices. You must have had it in your Indian curries especially chickpeas or starters. 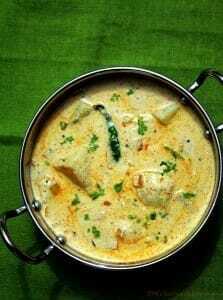 Its so subtle that you hardly get to taste it separately but it gives a dish a full-bodied flavour. Hi Mikel,If you happen to have an Indian store nearby you are surely going to find it there. If not and if you fancy trying it then the internet is your next bet. There is a link in the post too. Such good info Sunrita! Definitely want to try this the next time I make my Stir fry! Thanks Jubilee (love your name :-)! Hope you get to try it. This is so cool! I love learning about new foods and spices and I’ve never heard of this one before. I can’t wait to get my hands on some and try it out! Hi Polly! As we know there are many different ways to pronounce and write words, especially in English :-), so I would not say you are wrong. Some people call it Amchoor too! So glad you found the article useful. You are doing the right thing on how to use it! I would love to try this out on recipe ! I bet it smells delicious. The name Mango caught my attention! Interestingly Anissa, it actually does not smell that great but it sure has a flavour enhancing property the moment its added to a dish. I agree with others. Very informative post. I use tumeric for my face. Any tips on other things that I could use? Hi Brianna! You can use turmeric for curing common cold and throat infection. Add a teaspoon of turmeric and honey to a cup of warm milk at least once a day. You sure will see positive results soon!